Mercy Eaton has come to Idaho to marry the man of her father�s choosing in order to help her family make ends meet back home. She just knows it�ll all work out. That's what she's told her sister and her traveling companions all the way from Massachusetts to Owyhee County, Idaho. Then she meets her groom. He's seventy years old. She nearly faints. Quill Roderick has no intention of marrying. Ever. As far as he�s seen, women leave�first his mother, then his great-aunt, then his first flame. Quill sees no reason to open his heart again, especially to some mail-order bride his crazy old uncle brought for him. But Mercy tempts him like no other with her unruly long red hair, sunshine smile, and the most alluring eyes he's ever seen. Can he keep his heart barricaded from this dangerous fireball, or are her kisses the master key needed to unlock his heart to a whole new world... Love. 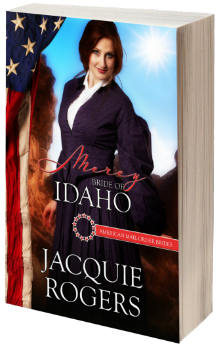 Mercy: Bride of Idaho is the 43rd book in the American Mail-Order Bride series. All content, including graphics copyright © Jacquie D Rogers 2005-2017, All rights reserved.